The ThiEYE T5e is recently released Chinese manufactured action camera. The T5e is one of the growing number of true 4K UHDTV cameras capable of recording 3840 x 2160p. (Note that many action cameras on the market indicate they record at 4K but many do not deliver on this claim. Our member Mtz has created a detailed thread in our forum on cameras that don’t deliver on this promise). To deliver 4k video, the T5e uses impressive components even though it is one of the lowest priced 4K cameras currently available.. The camera is based on the Ambarella A12LS75 processor and Sony IMX117 CMOS Sensor. When recording at 4K (2160p), the video quality is excellent during the day and good at night. Bit rate is 76Mpbs when recording at 4K. The level of detail at this resolution is excellent during the daytime. While many of the other 4K cameras on the market come with touchscreens, the ThiEYE T5e has a traditional 2″ screen. This helps keeps costs down. The T5e does come with with WiFi and supported with a free Android and iOS app (make sure you download the ThiEYE HD app not the ThiEYE app). Form factor is similar to the Go Pro rectangular shape with dimensions of 57 x 39 x 27 mm. The T5 comes with two 1100mAh batteries however owners have indicated battery life is not the greatest. 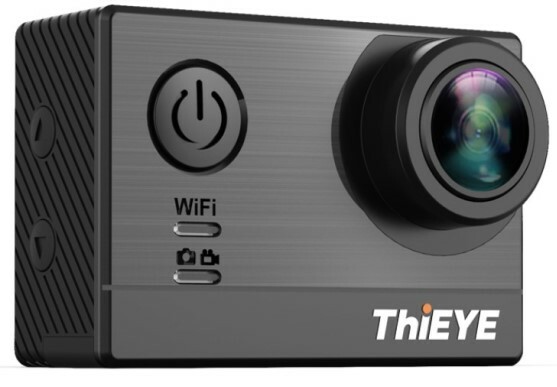 Unlike many action cameras which are missing features to allow for dash cam use, the ThiEYE T5e is designed to be used as a dash cam. The camera comes with loop recording, auto start / stop, a mount and the all black color makes it more discreet than most action cameras. We would like to thank our member Agie who created a detailed review of the T5e on our forum. This is a new camera and there haven’t been many problems reported yet. The ThiEYE T5e 4K is one of the most affordable true 4K (2160p) cameras available today. For a no frills 4K camera, it is good value for the money if you don’t need a touchscreen. Video quality is quite good as well. A nice feature is that it can be easily used as a dash cam since it has auto start / stop and loop recording. Many other action cameras omit these features. Overall if you have adequate hardware to watch and edit videos, the ThiEYE T5e is a good camera for the money and well worth consideration. See what other owners of this camera have to say in our ThiEYE Forum. Firmware update instructions are included in the downloadable rar files. For further information on performing a firmware update check out this thread in our forum. Final Word The most affordable true 4K (2160p) camera available today. Good value for the money.